Catoosa County residents stand in line on the first day of early voting at the Ringgold Voting Precinct. More than 12,000 people in Catoosa, Dade, Walker and Whitfield counties cast ballots in the first three days of Georgia's early voting period for the Nov. 6 election, according to the Georgia Secretary of State's Office. Advance in-person voting began Monday and runs through Nov. 2. 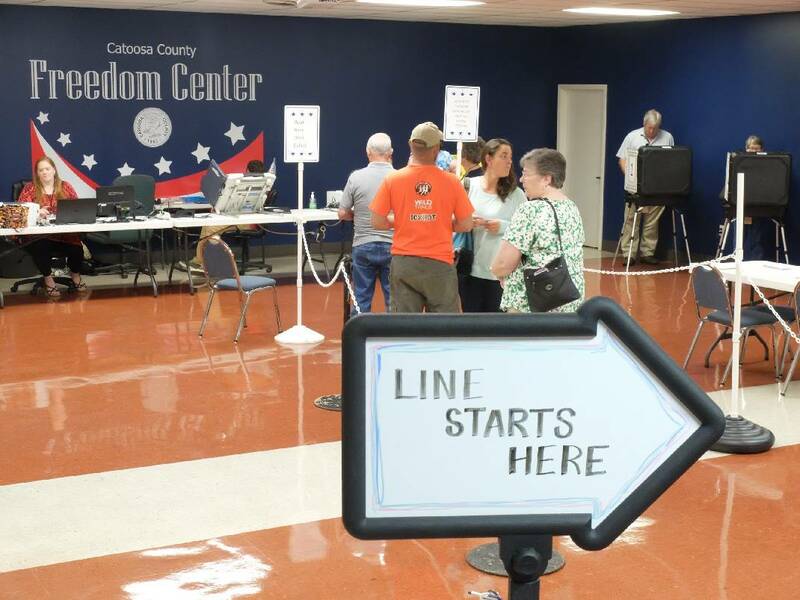 Figures posted on the secretary of state's website showed 5,159 people cast early ballots in Catoosa County. Dade County reported 917 ballots cast in the first three days. Walker County had 2,384 early votes and Whitfield County had 3,706, according to online figures. Those figures do not include absentee ballots. Here are the times and places for early voting in local North Georgia counties. Catoosa County: The Freedom Center, 5238 Evitt St. in Ringgold, and Westside, 3319 Lakeview Drive in Rossville. Hours are Monday-Friday, 8 a.m. to 5 p.m. In addition, the sites will be open until 7 p.m. on Nov. 1. Dade County: County administrative office, 71 Case Ave. in Trenton. Hours are Monday-Thursday, 8 a.m. to 5 p.m., and Friday from 8 a.m. to 2 p.m.
Walker County: County courthouse, 103 S. Duke St., LaFayette. The elections office is on the first floor. Hours are Monday-Friday, 8:30 a.m. to 4:30 p.m.
Whitfield County: County courthouse, 205 N. Selvidge St. in Dalton. The elections office is on the first floor. Hours are Monday-Friday, 8 a.m. to 5 p.m.